2. figure 8 backward: tell the dog to go into heel position and start spinning as we were doing on the target, then very suddenly stop and step back with the other leg (if the dog is at left side - with right leg), you can also make a gesture with left hand to try to get them to keep circling below the heeling position, eventually all the way around your leg, so that they come backwards between your legs back into front position. If the dog insists on staying in heel position, you can help with the hand a little bit, lure his head out (left for 90 degrees if the dog is on left side) and say back to have them back up in your direction. Step back with the other leg enough to have them back up between your legs. Reward and tell them to heel on the other side (right) and repeat the process. As soon as you get some smoothness with that, stop rewarding for coming in between, always first tell them to come to the other leg and reward at your side in order to avoid having them back up too far - they need to stay very close to your legs all the time. 6. don't forget on recalls and playing, stays with distractions (you can combine it all in a really fun game), try the hug on a plastic bottle or something similar that is light enough for the dog to hold it and have them hold it independently, add more steps to backing up from you, tape the 4in the bowl trick again so that I can see to what size you managed to get: the smaller the better! Back from the Clicker challenge! So it wasen’t too difficult and Ayoka did well. Only for the third exercise in the afternoon she was to tired to learn something new. You were not allowed to use known commandos and hand signals or luring! And you had only 2-5 minutes depending on the level and the exercise! Level2: 2 font feet on and standing calm for 3 sec. Level3: 4 feet on standing calm for 5 sec. seems easy but the object was rotating very quickly when touching it! 3 magic hats standing on a bench (for littel dogs standing on the floor) in one there was a white mouse, in one there was a white rabbit and one was empty. The 3 hats have been covered with each with a magic cloth. Level 3: Level1 + put out the white rabbit and put it in the empty hut; then put out the white mouse and bring it to you. 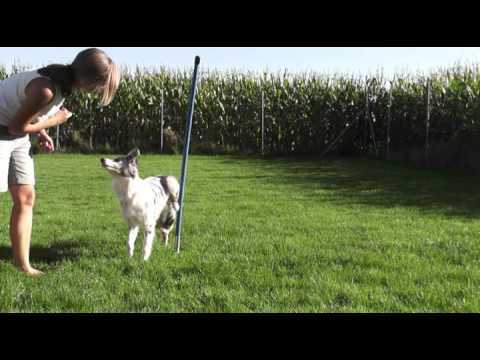 Exercise of the day: juggling; during the day you could work with your dog to make noise with different funny objects. Sounds fun! And pretty challenging, especially level 3! Do you need to win your way to different levels or you can simply choose it? Hi Silvia, at the moment, as these schallenges are very new here, you can choose your level by yourselve. If you start in level one and have still time left you can go on up to level 3. And up to now, there is only one winner of the day and it is choosen by the starters as the mostely creativ dog. So the pressure ist not very high. Wow, she is bigger on every next video you send! Great job! Exactly. October Puppy Class is a repeat of this class and More Tricks will start end of October/beginning of November and will be for Puppy Class Graduates only, so a progression of this class. 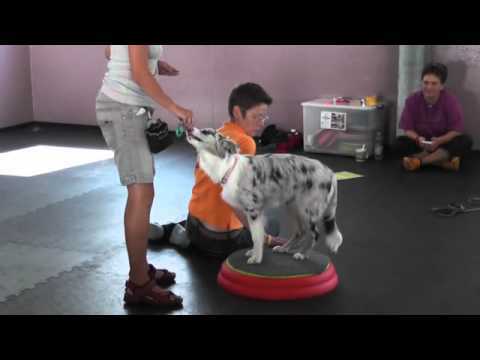 No, Foundations are agility-oriented and More Tricks Class is just -- more tricks 🙂 for those who finished Puppy Class but want to do some more tricks (no equipement needed). But if you have jumps, just not a tunnel, you could still do Foundations and just do tunnel exercises with the jump instead, it doesn’t really matter. Oh silvia, that makes it very hard to choose for us. more Tricks ore Agility? I really need more hours in a day! I think Foundations and More Tricks are easier to keep up with as this class, so it should be doable. And, Foundations start one month sooner! Bu was always very weird. When we came to see the puppies, she was the only puppy (from two litters) who didn’t come to us to investigate and check what’s up when I bended down and called them in a high happy voice. I first though she must be deaf, but I checked it and she heard well, she was just not interested. The breeder wouldn’t give me another puppy as everybody was there before me and even though he promised me a choice between two females, I think the person getting the other one was praying him for the other one, so at the end, he would only give me that one and as I really liked the line, I took her, thinking she is a BC afterall and must have some drive and we can then overcome other problems. I was wrong. She was never interested in food or toys, didn’t respond to praise AT ALL and didn’t follow on our walks: she would just wander off as a 8 weeks old puppy (never saw a puppy do that before!) and when I had to run after her, she would look at me like “hey, what’s up?”. Now, that’s probably more as you wanted to know 🙂 She sure presented me with some completely new challenges. She is a genius and can run any course with mathematical precision, she never missed weave entry in her life etc. -- our only problem on World Championships is microchip check… How weird is that?!? Yeah, I’ve heard thousands time I’m crazy to keep her and spend time on a dog like her… But I LOVE spending time with her! It was somewhat frustrating at the beginning as Basenji puppies from my puppy school were doing so much better as her, but I really love her the way she is. She is the sweetest dog I ever met, impressively smart, my only well mannered dog 🙂 -- so I won’t take any credits for that! 🙂 -- and you just have to love those weird ideas and obsessions! Oh thank the dog gods that YOU are the one that got that puppy. How wonderful for her to have so much clarity and safety in a life that could have been anything but. Thank you for sharing her story! It keeps amazing me how different and individual every dog is. They for sure have their very own personality, sentiments etc. I was at a gathering with all of Pennys litter this weekend and they’re SO different even though they have the same genes. Thanks for that story. People still think that they can buy the perfect dog by only choosing sucessfull parents. They often don’t see the much work you need for beeing sucessfull and that not every dog is like an other. We are a little behind this time.. but this is where we are at for lesson 5. I included a clip of Toby’s unique approach to getting the hug object in his arms. cik/cap: He prefers clockwise but we are working on the other direction also. Figure 8 backwards is still pretty awkward and it looks like I am cutting his head off with my legs! Skateboarding: In the video it looks like he is going downhill but it is just the camera angle -- the ground is flat! He is too funny on his skateboard! Great job with cik&cap! Loved the peeing in between! 🙂 At this point, you can switch to a toy to get more enthusiasm. Getting there with figure 8, slowly help less by stepping less and less back, so that he needs to do more&more of a turn himself. Once he gets more fluent, he will start to watch out for his head more 🙂 -- but yes, that’s an extra challenge with tall dogs 🙂 And what a creative way to get a hold of an object, too funny! 🙂 Now let’s see what he comes up with if you sit on the floor or stand up! Silvia, I have a question about duration, specifically the time between clicks (which translates to Grit as the time between rewards). I noticed that as I’ve asked for 1/4, then 1/2, then 3/4, etc turns around her object, she seems to lose interest, I think because it takes longer and longer to get the cookie, especially since she’s walking pretty slowly. Maybe this exercise is really not the best to prolong time between the clicks as she didn’t like it too much in a first place. Try with the tricks she finds more fun first. You can also try talking to her in between so that she knows she is not doing anything wrong and then reward even more enthusiastically at the end, so that she learns that no reward is not necessarily a bad sign. But of course, she needs to know the exercise pretty well already -- could be she doesn’t get the circling thing well enough for that for now, so definitely pick another trick to try it first. Sure, send it. But you can as well leave it alone for a while, work on duration with other tricks first and then come back to this one. Well, last night, I *thought* I was working on sending you video, but Grit had other ideas. All she wanted to do was put her paws on top of our new narrower object, so I decided to switch to a table leg instead, and that needed more shaping 1st. But I will say, it takes a lot less time to get around a table leg than that big bucket I was using, so maybe I was just making it too hard for a puppy!! We’re working on Cik Cap which is going pretty well. I’m starting to use a toy to increase speed, but I haven’t built a full retrieve with Echo yet. For now I’m using a long tug so I can toss one end of it while I hold the other. Do you have other suggestions? I’d also love to hear how you teach a retrieve. I’m working on a couple of things that are helping, but we’re sure not there yet. Huh, what I usually do is to play tug, release a toy for a second, move two steps back quickly, call and tug again and then just make a distance bigger&bigger, running around and having them follow me with a toy, making it a fun game of “attack Silvia with that toy”. Le was my first dog who didn’t get it. She is a little fighter and would always proudly take the toy away when she won it -- and if I called, she came without the toy… So when I started running contacts with her, I just got 6 tennis balls and throw them one after another for her and then picked them up all. By the time I had only one ball left (other got lost or destroyed), she has learned to fetch it back without any real efforts in that direction other than always throwing her another ball after she won one. What does Echo do after getting the toy? Did you try two toys? When we’re tugging during training (as a reward, for example) if I let go she dances off, swinging the tug by herself or settles down to have a chew session. If I’m tugging with her while playing and I drop the tug and run away, she chases me, but as soon as I turn around, she drops to the ground to own the toy she’s still holding, if I ignore her and run past again, she chases me again. If I call her, she’ll come with the toy but if I reach out for it, she playfully whips it away. She doesn’t necessarily run away, she just plays keep away in place. That’s not bad of a start at all if she already fetches a ball and runs after you with a tug. Maybe you can teach her a nose touch to your hand and then try it while she holds a toy (you keep on a string for now so that she can’t run away): click for a nose touch, tug for a reward, release the toy and ask for a nose touch again-tug-release etc. OK. that’s a great idea. She has a nose touch so I’ll try combining them. I’ll let you know! here is my video with Revi. 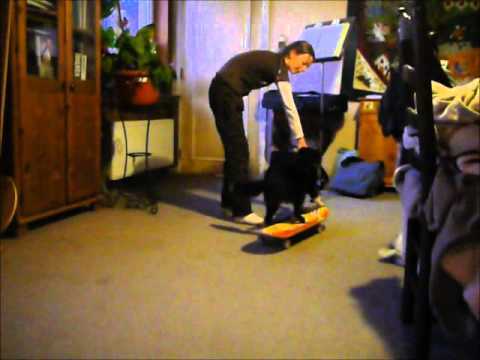 The skateboarding was just her second session, now it’s already improving a lot (one paw off and pushing)….for the figure 8 backwards, I had to lure a bit, as she didn’t understand the backing up-part and got too confused. I am looking forward to your feedback ! What a funny dog! Love your slow motions and the noise Revi makes during the sit ups! Wow!! You and Revi make such an incredible pair. You’re doing amazing things with your little fox… I mean dog 😉 My, oh, my but she is darling!! And she sure has a lot of drive. Yes, Sandra, Revi is a funny dog and in daily life she behaves more like a cat actually…I don’t know how foxes do behave, Rachel 😉 but yes, she has a very long and thick tail that reminds us too of a fox. Every trick that does not include lots of action, is a problem with her. Even now, she still doesn’t understand the crossing paws, it’s too passive…she has lots of drive and wants to move all the time, also during the day. A normal life with two hours hiking and three times clickertraining and lots of playing is not enough for her…. Great job! She sure looks to like the skate-boarding! Almost three with figure 8, you can try using less help from a hand now. Very cool cik&cap! Can she do multi-wraps too? Heeling is very cute too, but try to click when her paw is not on your foot! They like to target the foot, but it actually ruins their position some, so slowly try to get rid of it. Great balance with side legs! Great progress with picking up a toy and really cute sit up! Thanks, Silvia ! Yes, she likes the skate-boarding, because it’s moving and she loves things that move. We must practice multiple wraps ! I will do it. With the heeling, yes, she loves to target the foot and I must get rid of it. So we will continue as you say ! I sometimes forgot to film the other side, but we always trained both sides. In the clip you sure can see the better side ;-). 8 backwords: I tried it once and think we will have no problem with it, but for the moment we had the focus on the other things. What a great skateboarding! Lots of fun to watch! Great stays too! Getting there with side legs! Nice job with cik too. Try to reward closer to an object and in the direction of a second circle to eventually get more circles. Very cute pee trick! I would keep rewarding heeling more for now to really get 100% focus and position. Her duration is definitely amazing, but I prefer working on little details first, before adding duration, especially with such a young dog. Great job! Thanks Silvia,Yes I recognized that she is coming always to my side leg after the cik. I tried throwing the food in the circel, but she didn’t see it. So I maybe change to a toy now.(?) Some articles bevore you wrote to reward the cik with ‘head low’ and it is better with lower object. What’s the background of it? Sure, she definitely looks ready for a toy! You don’t really need a low object for a low head -- I use stick in the ground pole. But you do need to reward low. Rewarding high often gives you high head, looking at you instead of an object and if it persist when this becomes a jumping exercise, you get inefficient way of jumping. Of course, by low head I don’t mean a head all the way to the ground, but normal level or somewhat lower, definitely not higher from a normal level. Your right, that could be one of the problems I have with Roxy in Agility. She is always is looking at me , doing every movement I do and than she drops the bar! Yesterday it was the same again and so we never will go one class higher!. but I startet with my Collie Gino yesterday first time in class A2 and he reached the 3.place with a V0! Very proud of him. First year training with him I tought he would never be abel to jump and have fun with it! Congratulations on the 3rd place! And yes, you definitely don’t want a dog to look at you when running, it’s not good for keeping the bars up OR general speed. Of course, they need to have good handler focus too, but only when you call, they should be focusing on obstacles if not. We still have a ways to go with most things in this lesson. Chewy’s favorite trick to work on now is side legs. I only have one side in the video, but we are working on both. For the other tricks, he is very one sided. He only wants to go one direction around an object, and he heels much better on my right than my left. I’m finding it difficult to fade the target, especially for the true “heel” position. We have only done one session on backward figure 8, which you’ll see at the end. The interesting thing I’m noticing is that dogs that prefer right side have more problems with the other side as dogs who prefer left. My other dogs preferred left, but with some more work on right, it’s very hard to impossible to still see their preference. Bi is my only dog who prefers right -- and you can still easily see it despite I worked A LOT to improve left side. I noticed the same pattern with dogs’ from my students: most dogs prefer left, but can easily get o.k. with right too, but those who prefer right tend to really have hard time with left. Anybody else with this experience? Anyway, I don’t have any better advice as to practice the other side even more… For left side heeling, I would mostly still do circles, as on a target, just without the target, and then making the steps still somewhat in a circle and somewhat to the side or ahead and then slowly make it look more like real steps ahead or to the side. Almost there with side legs! Very cool skate-boarding too, he definitely looks to like the movement under his feet! On figure 8, he circles your leg very nicely, what is still missing are a couple of steps back after that to get to the other leg. You can simply tell him back if he knows a verbal cue for backing up by now? Great job so far! And I see Chewy did some growing since the last video!